You are at:Home»Herbs»Aquilaria agallocha Roxb. Latin name : Aquilaria agallocha Roxb. Description : The bark is acrid, anodyne, antiasthmatic, antiinflammatory, antidiarrhoeal, antidysenteric, antimicrobial, aphrodisiac, aromatic, astringent, bitter, cardiotonic, carminative, cholagogue, demulcent, deobstruent, depurative, digestive, diuretic, nervine, rejuvenating, sedative, stimulant, thermogenic and tonic. It is an ingredient in various nervine tonic, carminative and stimulant preparations. It is useful in gout and rheumatism and to check vomiting. Also useful in seminal and sexual debility, giddiness, nausea, cirrhosis of the liver, high blood pressure, halitosis and leucorrhoea. It relieves spasms especially in the digestive and respiratory systems and lowers fevers. Strengthens the chief organs of the body and is also used in anxiety, depression and calming of minds. The Local application of Agar wood is stimulant and fragrant. It is anti-inflammatory and analgesic. Agar Wood helps in skin disorders. It is used in static condition, chronic ulcers and wounds, ringworm skin diseases and inflammatory and painful condition. Agar Wood helps in rheumatoid arthritis and osteoarthritis. It also relieves itching in pruritus. Agar Wood is a mouth freshener; carminative and appetizer. Agar Wood is given internally in rheumatoid arthritis, loss of appetite and other digestive ailments. Agar Wood is a stimulant, improves blood circulation. It is used in gout. 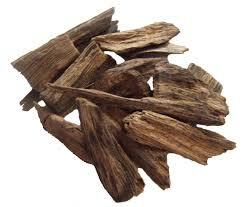 Agar Wood reduces cough and helps in bronchitis and asthma. Agar wood is nerve stimulant and Vata pacifying in nature. It has been recommended in paralytic condition and Vata diseases. Agar Wood relaxes the bladder, helps in preventing bedwetting and polyuria. Because of its cooling effect, Agar wood is used in fevers associated with chills, both internally and externally. Oil massage with Agar wood oil is effective in rigors in fevers. Recommended Dosage : 500 mg to 2 g powder of dried heart wood.